Celebrity Cruises has unveiled its first ever brand-designed cruise terminal, Terminal 25 (T25), located at Port Everglades. Celebrity said that T25 melds a "gorgeous, warm design with unique technology, such as Frictionless Arrival, which will make the check-in process absolutely seamless, and an interactive light wall art installation." T25 will also offer Suite Class guests a singular experience along the path to The Retreat, with an exclusive lounge, elevator lobbies, screening areas and even a private rooftop terrace. "When designing the revolutionary Celebrity Edge, we knew we wanted to design a terminal that perfectly complemented the ship and matched its one-of-a-kind experience," said Lisa Lutoff-Perlo, President and CEO, Celebrity Cruises. "With cutting-edge technology, in service of a gorgeous design, T25 is that perfect new home. T25 also happens to be Celebrity's first ever brand-designed cruise terminal, which not only represents a milestone for Celebrity, but also presented us with the opportunity to set yet another standard in design and create the perfect guest experience." 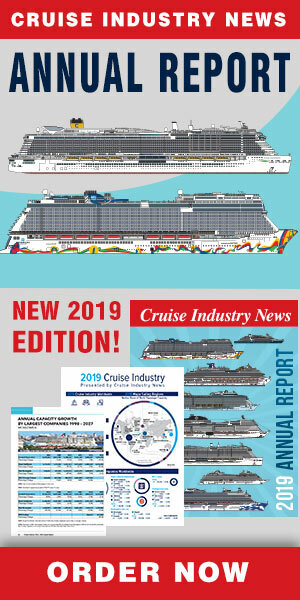 "This is the largest financial investment that Port Everglades has made in a cruise terminal, and we fully anticipate that Terminal 25's iconic design will be a showcase for Broward County and Celebrity Cruises as we strive to create an inviting and fun environment for the millions of cruise passengers who visit here," said Broward County Mayor Beam Furr. "We are replacing two smaller and outdated cruise terminals with an innovative facility that is inspired by the sleek, futuristic design of Celebrity Edge and can accommodate some of the world's largest cruise ships," said Port Everglades Chief Executive and Port Director Steven Cernak. "The time was right to build a new Terminal 25 that uses cutting-edge technology, such as electronic media-mesh for innovative messaging, to attract contemporary travelers who want to explore the world." T25 also features a 1,463 sq. ft. GKD Mediamesh that will wrap the terminal's exterior, with more than 18,000 sq. ft. of outward facing glass, and the first purpose-built crew lounge of any Royal Caribbean Cruises terminal. This crew lounge will have complimentary WiFi connectivity, TV access, optimized storage, quiet places for employees and more. Currently, Port Everglades welcomes on average approximately 335,000 Celebrity guests annually, representing about nine percent of its overall passenger traffic. Once the new cruise terminal is completed, it is anticipated that Celebrity will generate nearly 500,000 travelers at Port Everglades – representing no less than 14 percent of the port's projected passenger traffic, the company said.